Every time we go to Lakeshore Learning Store, Hazel becomes obsessed with their Magnetic Fishing Set (the store leaves toys out to be tried). I had seen one to make in Creative Play for Your Toddler: Steiner Waldorf Expertise and Toy Projects for 2-4s by Christopher Clouder and Janni Nicol. I had big plans to make really fancy fish. I even started them, but never finished. 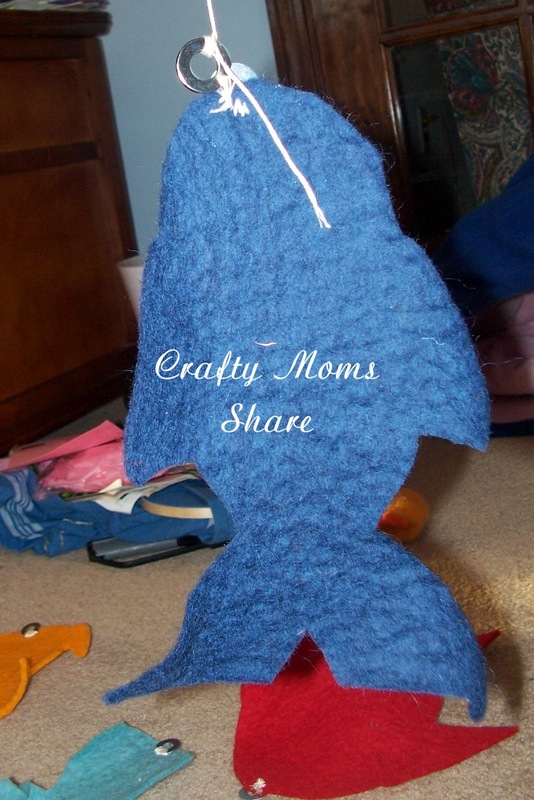 I did a needle felting kit of a fish that reminded me of The Rainbow Fish. I have to find where I put it so I can finish it for her. If you haven't heard of The Rainbow Fish by Marcus Pfister, it is a wonderful book that teaches that being beautiful and having nice possessions is not the most important thing, but being kind and sharing will be more rewarding in life and bring you happiness. It is one of our favorites. Then of course last weekend we went to our church's Easter Fun Day and they had magnet fishing which Hazel loved. 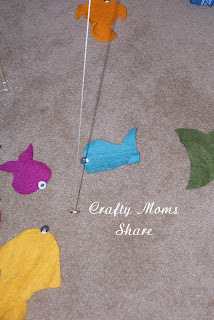 There they did simply paper fishes with a paper clip where its mouth should be and a magnet fishing pole. This got me motivated again. 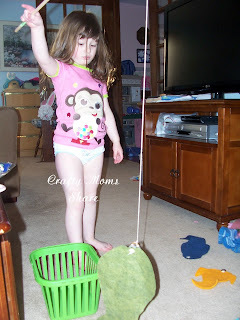 Oh, and Hazel was using cat toys with a plastic Easter egg stuck on the end as fishing poles and kept needing help when the egg fell off. It was driving me a bit crazy. 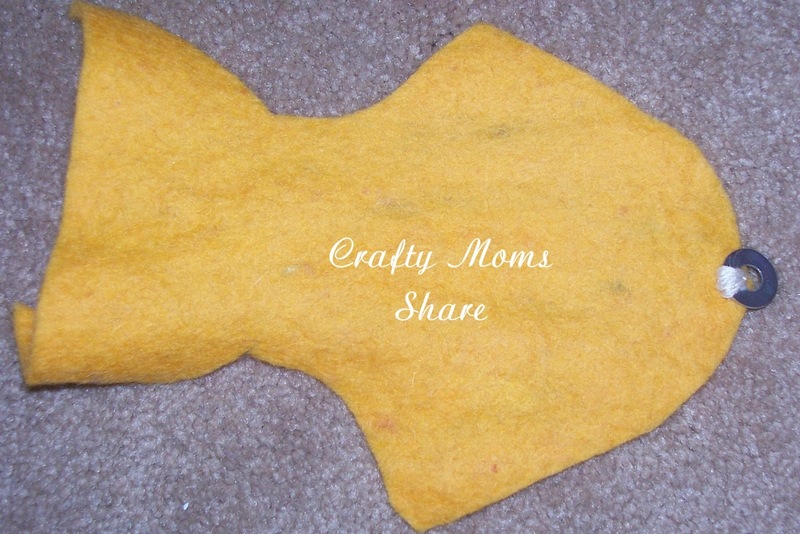 So I decided instead of fancy fish to make simple fish. I cut them out of wool felt. Then I looked for some washers. I couldn't find the ones I had put away over the summer so I went to Home Depot. We have a friend from church who works there and always helps me find what I need, so it makes it easy to shop there. 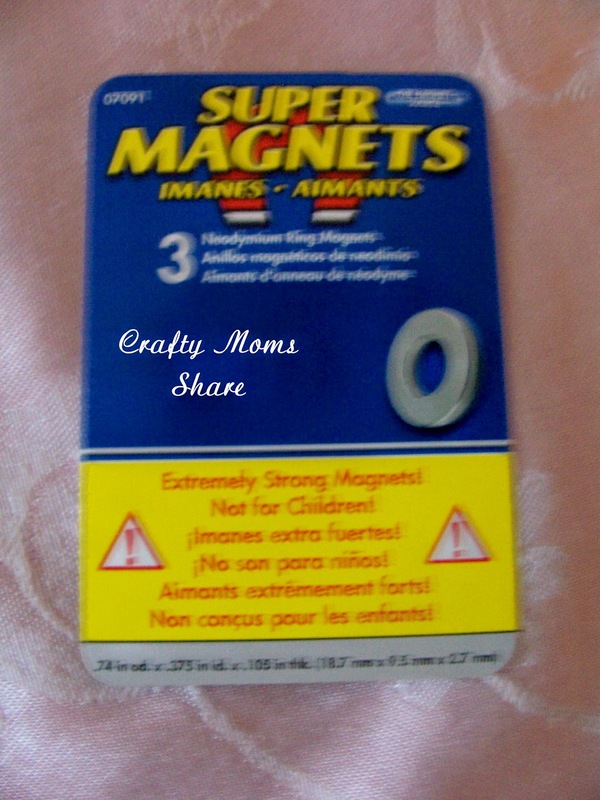 He found us a good package of washers and some super magnets. Of course we didn't get to Home Depot right away so we tried paper clips but the wool felt fish were too heavy and the paper clips too small. We did a few paper fishes that Hazel cut out herself. 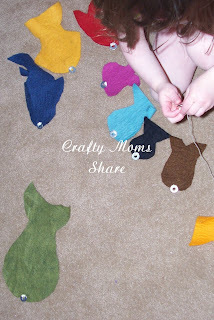 So Friday afternoon and evening I spent sewing the washers on the wool fish. I used embroidery floss to sew them on. Then for the fishing pole, I bought a wooden dowel and had Steve cut it in half. 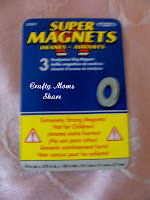 I tied a string to it and tied on one of the super magnets. I made two so someone else can fish with her. Now we are ready to go fishing! She loves it and played for quite some time. 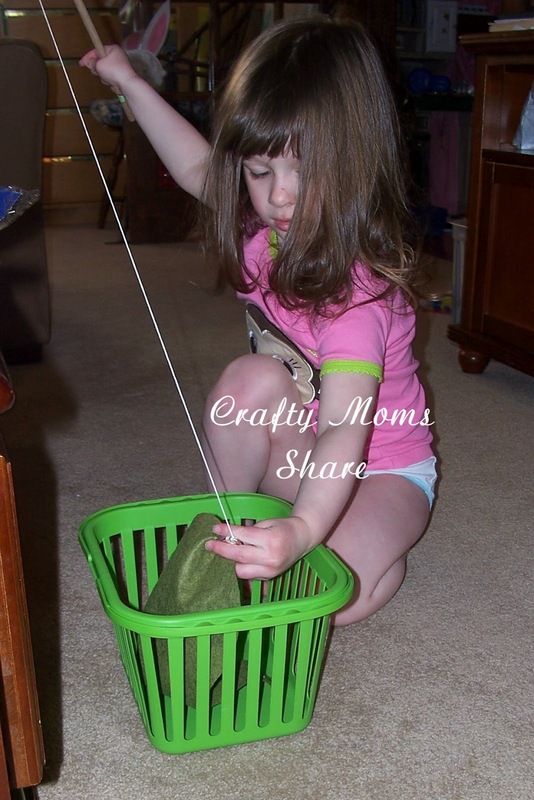 She even got out a basket to put the fish in after catching them. Oh, and brought out containers of food to feed the fish in case they were hungry. Guess she doesn't quite understand about bait yet. Oh, well. Have to share this last picture. While I was typing this up, Hazel had her doll, Bella, as a fishing partner since I was too busy. Well we are off to go fishing. Hope you are having a great day!! I love how you used washers on the fish! Such a great idea! Thanks for sharing at Teach Me Tuesday!! This is cute! 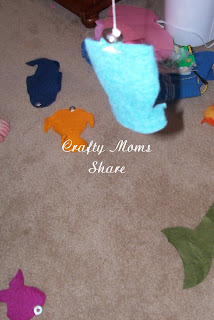 Thanks so much for linking up to Made for You Monday! Cute! 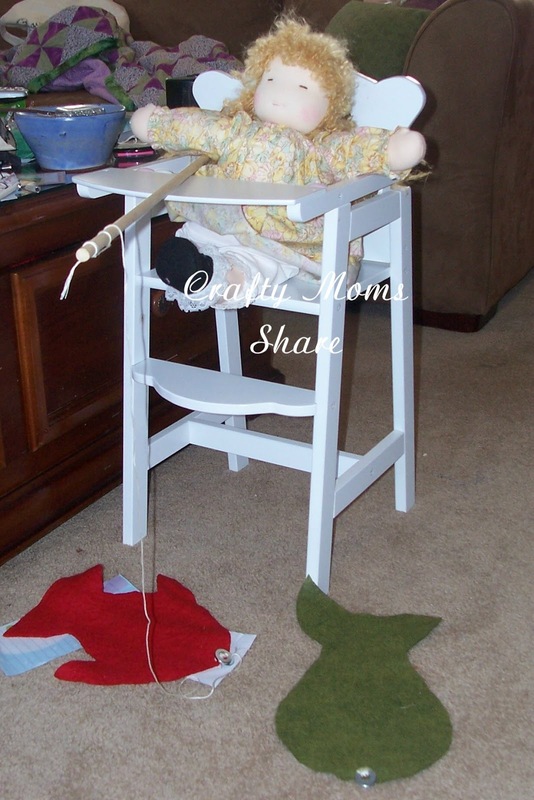 And I love that she had her doll fishing with her!